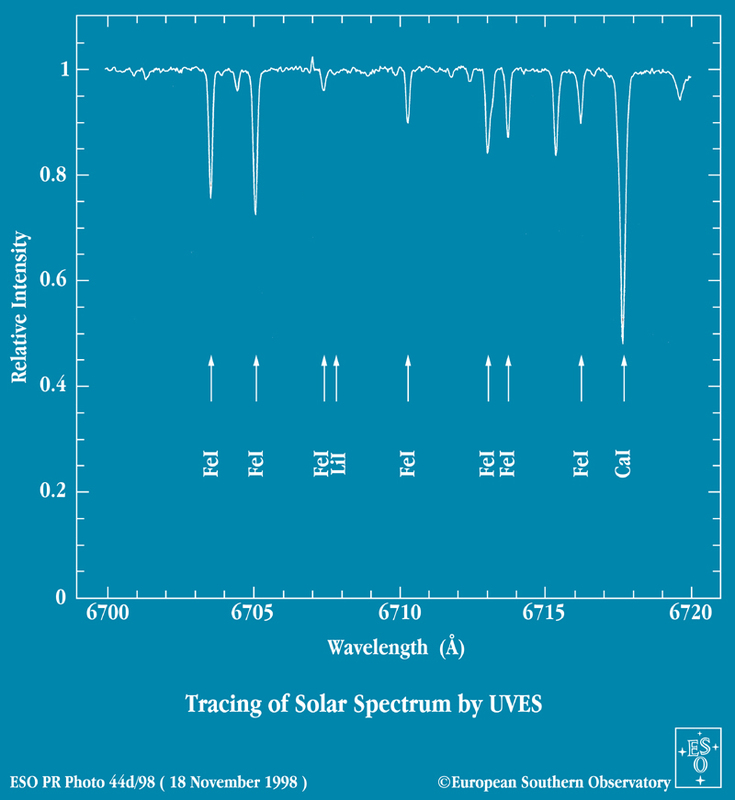 Okay, suppose you use a spectrograph to measure the light emitted by a star at optical wavelengths. Note that our simple analysis will tell us only about the outermost layers of the star. It is possible to investigate the interior, but it takes quite a bit more effort. When you look at me, you see light which is emitted by the flourescent bulbs overhead and bounces off me or my clothing. If I turn off the lights, and close all the shades and drapes so that no outside light can enter the room, will you see me? No. But a rattlesnake could. How? The rattlesnake has organs which can detect the heat my body gives off. 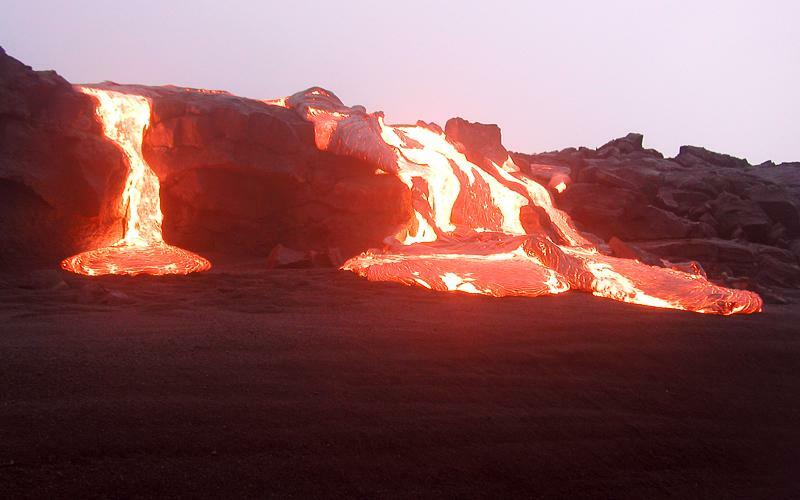 Heat is, in fact, one kind of electromagnetic radiation: the kind we call infrared. Even if no lights shine upon me, my skin still emits this infrared radiation. In fact, to a rough approximation, all objects emit radiation in a manner which depends largely on their temperature. Human eyes can't see this radiation when an object is at room temperature ... but they can begin to sense it when the temperature rises to many hundreds of degrees. You don't need sophisticated equipment to determine temperatures very roughly; just look at the sky with your own eyes. 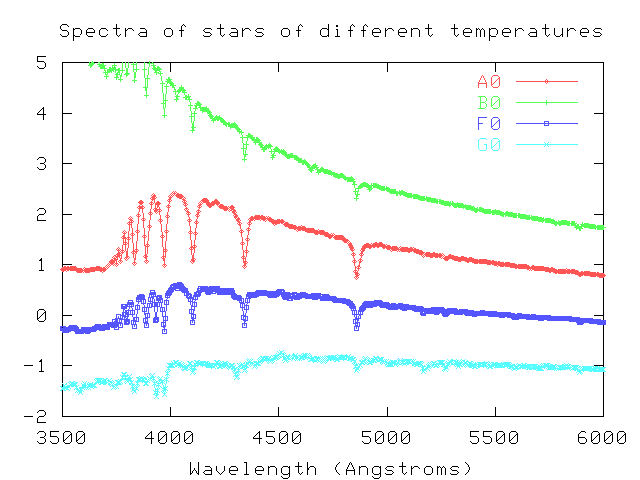 Red stars are cool (temperatures below 4500 K), and blue or blueish white stars are hot (temperatures above 9000 K). People have long known that the stars are far, far away; in the nineteeth century, astronomers finally measured the distances to a few nearby stars with reasonable accuracy. The results were so large -- thousand of trillions of miles -- that most people figured we'd never be able to visit them or learn much about them. 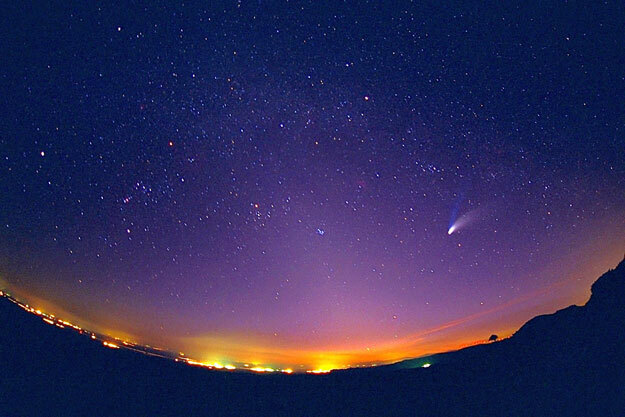 After all, we can't go to a star, grab a sample, and bring it back to earth; all we can do is look at light from the star. In fact, at least one prominent philosopher and scientist went on the record as saying that we'd never be able to figure out their compositions. But, it turns out, light from the star encodes a wealth of information about the physical state of its outer atmosphere. Light is produced in the inner regions of a star and works its way out to the "surface" -- which is really a part of the gaseous atmosphere called the photosphere. Photons produced in the photosphere have a good chance to escape outwards into space and, eventually, reach us. As photons fly through the outermost layers of the stellar atmosphere, however, they may be absorbed by atoms or ions in those outer layers. 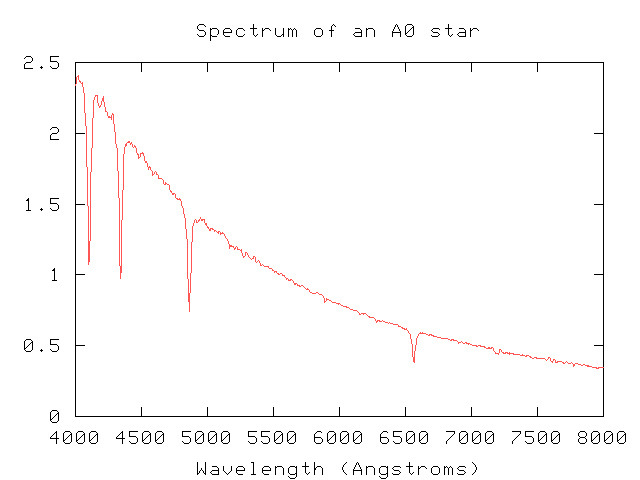 The absorption lines produced by these outermost layers of the star tell us a lot about the chemical compositition, temperature, and other features of the star. For the details, read Sections 7.2 through 7.4 in your textbook. 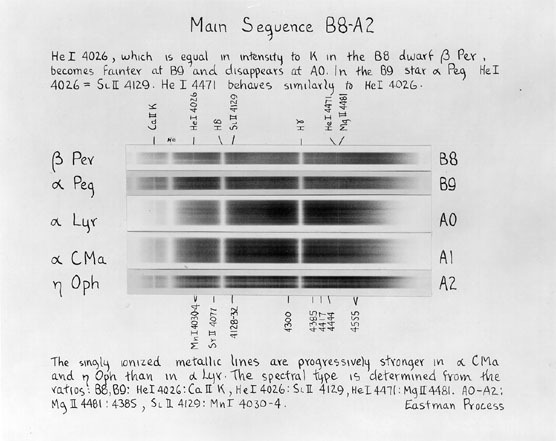 There are a LOT of features in stellar spectra, if you look close enough. 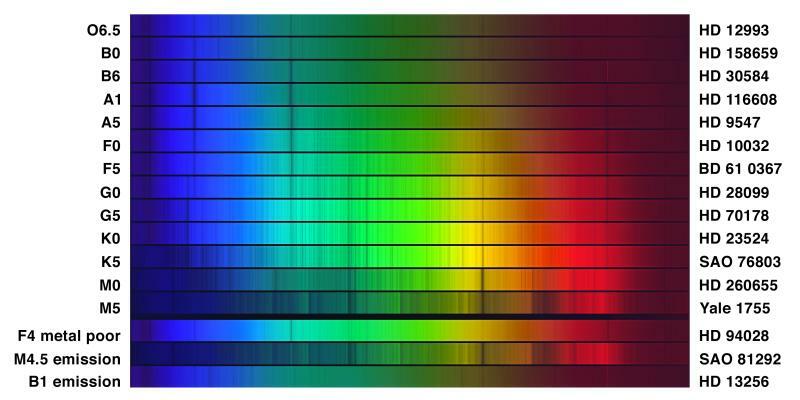 Here's a teeny section of the solar spectrum, from wavelength 6800 to 6820 Angstroms. First I show it in "photographic" form, with dark lines on a bright background, as you would see if you looked into a spectrograph yourself. Below is a graph showing intensity as a function of wavelength. Note how many lines can be measured and identified, even in this teeny section. detailed analysis of the intensities of these (and other) lines provides an estimate of the relative abundance of each element. In the Sun, about 25,000 iron atoms and 2,500 calcium atoms for every 1 lithium atom. But wait -- look again at the spectrum above. The calcium absorption line is much stronger than the iron lines. Shouldn't that mean that there are more calcium atoms than iron atoms in the solar atmosphere? What does that mean, "the right energy state"? The electrons which orbit nuclei of atoms can move only in a few specific orbits. Small orbits have low energy, and large orbits have high energy. If we shine a photon with slightly more energy past a similar atom in its ground state, the atom won't absorb it, because the photon doesn't have exactly the right amount of energy to push the atom up into its next excited state. Instead, the photon will go right past the atom. 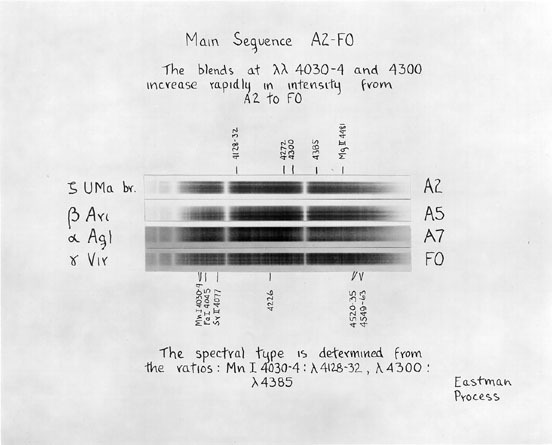 Below are spectra of four stars. All of them have hydrogen in the outer atmospheres, which absorbs light at a series of wavelengths: at about 4860 Angstroms, 4340 Angstroms, 4100 Angstroms, and so on. This series of lines is called the Balmer series. It is formed when atoms which are in the first excited state absorb a photon and jump up to a higher excited state. B0 stars are so hot (T = 35,000) that the hydrogen atoms are mostly in very excited states. Since few are in the first excited state, few absorb photons with these wavelengths. Therefore, the lines appear weak. A0 stars are just about the right temperature (T = 9,500) for most hydrogen atoms to be in the first excited state. Therefore, many atoms absorb photons with these wavelengths, and the lines appear very strong. F0 stars are at a lower temperature (T = 7,300), so many of their hydrogen atoms are in the ground state. These atoms can't absorb photons of Balmer wavelengths, so the lines appear weaker. G0 stars are so cool (T = 5,900) that very few of their atoms are in the first excited state. The lines are very weak. 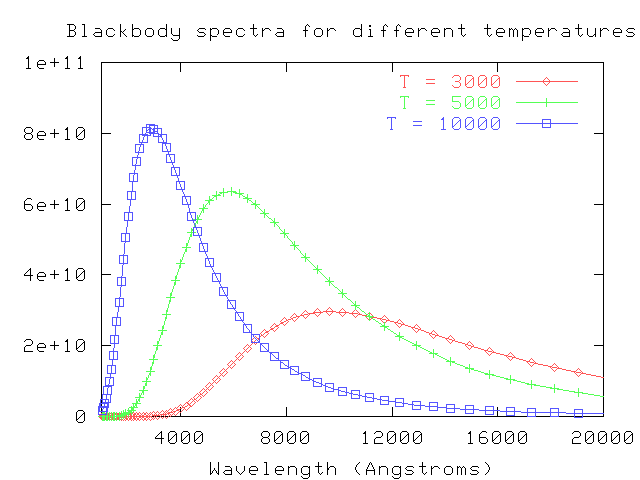 This blackbody spectrum applet shows you how the spectrum of an object changes with temperature. Thanks to the LearningOnline Network and CAPA. 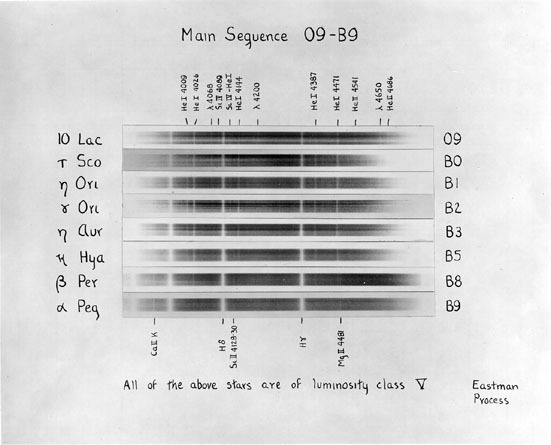 The CLEA exercise on Classification of Stellar Spectra allows you to classify spectra just as the Harvard College astronomers did 100 years ago. Looking for the source of some particular spectral line? 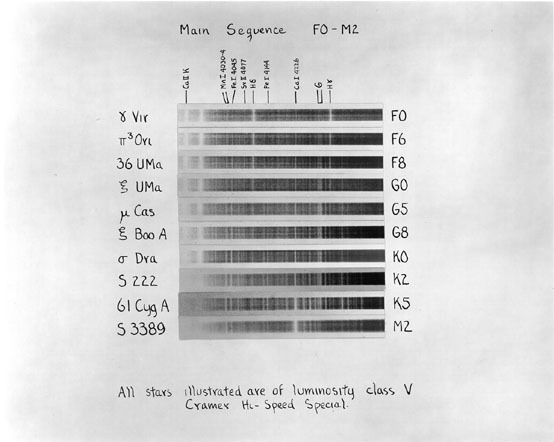 Check out the Spectra of Gas Discharge page.